Barcelona superstar Lionel Messi has reportedly picked a match against the Super Eagles of Nigeria as one of his favorites in the 2018 World Cup in Russia. Argentina’s forward and captain Lionel Messi celebrates after scoring a goal during a Group F football match between Argentina and Iran at the Mineirao Stadium in Belo Horizonte during the 2014 FIFA World Cup in Brazil on June 21, 2014. The winger who was superb in Argentina’s win against Ecuador which gave the South Americans the World Cup ticket was said to be looking forward for his country to face Nigeria in Russia. Messi was reported, according to National Helm, to have said that a game against Nigeria was among his favorites games. He has played against Nigeria twice at age-grade level – the 2005 World Youth Championship and also the 2008 Olympic in Beijing – winning both times. At senior level, he has scored three times in the three games he has played against Nigeria – a brace at the last World Cup in Brazil and a goal in a friendly game played in Malaysia in 2012. 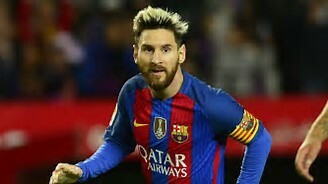 “He was speaking after his hat-trick for Argentina against Ecuador, he was asked his best games for his country and he picked his debut at the World Cup against Serbia which Argentina won 6-0, and also the final game of the Olympic in Beijing which they won 1-0 against Nigeria, then the game against Ecuador,” Sky Sports’ Guillem Balague said.